Pilots in the Fleet Marine Force joined tactical operational squadrons and flew the aircraft assigned without thinking about the trip that aircraft had made from its concept through development and flight testing, acceptance and delivery to the Fleet. When HQMC selected me for a regular commission in April 1958 and thereby extended my active duty time forever, I immediately volunteered to join VMA-211 for a fifteen month WestPac deployment. Factors contributing to my WestPac decision were, after over four years in the continental United States, I was due to receive individual orders overseas and VMA-211 was receiving brand new A4D-1 Skyhawk Jets. I cherished my two years in the stalwart Able Dog prop-driven Skyraider but after flying the T-33 Shooting Star and the F9F-2 Panther in Flight School, I wanted back in jets. The Skyhawk thrilled and impressed me on my Familiarization One flight. The little jet seemed to leap off the runway and immediately got my attention by wobbling and swaying back and forth while accelerating to climb airspeed. The wandering wobble took a few minutes to get used to but the Tinker Toy seemed to stabilize smoothly upon reaching cruise airspeed. I was in love with another airplane! I cared not what her past had been. I only knew we were in for an adventurous, exciting and lasting relationship. A look back at how the Skyhawk originated reveals that Douglas Aircraft Company Chief Designer Edward H. Heinemann convinced his Company leaders that there was a military requirement for a simple, tactical jet aircraft with two long range fuel tanks on wing stations to carry and deliver a centerline nuclear weapon if and when required. The AD Skyraider was propeller driven and considered slow in the blossoming jet world of aviation. Additionally, the Skyraider had marginal survivability when dropping a nuclear bomb. Douglas Aircraft designed and developed the aircraft with Company funding. The US Navy contracted with Douglas Aircraft to build one prototype XA4D Skyhawk attack aircraft BuNo 137812 on June 12, 1952. After review of the design in October 1952, the Navy ordered an additional 19 A4D-1 aircraft. Douglas Test Pilot Robert Rahn flew the first test hop on the Skyhawk powered by a Curtiss-Wright J65-W-16A engine at Edwards Air Force Base on June 22, 1954. Gordo Gray from NATC Patuxent River, went to Edwards AFB in early 1955 and flew the first Navy Preliminary Evaluations (NPE) on the Skyhawk. The little jet had no tailhook or refueling probe. The cockpit was small and not comfortable for pilots over six feet tall and over 200 lbs. The second XA4D BuNo 137813 took over many improvement tests conducted by DAC. XA4D BuNo 137813 is now in the National Museum of Naval Aviation at NAS Pensacola, FL. The first YA4D (BuNo 137816) was delivered to Navy Pax River in mid 1955 for further evaluation of the new aircraft for fleet acceptability. Major General Hal Vincent USMC Retired relates in the following paragraphs his early introduction and flight testing of the YA4D Skyhawk. Hal Vincent was assigned to the Flying Qualities and Performance Branch of Flight Test at NATC Patuxent River, Maryland in July 1955. Hal worked the same projects as Gordo Gray who had already run NPE evaluations on the XA4D. Hal was initially given primary responsibility for conducting tests on the F7U3M Cutlass and the S2F. 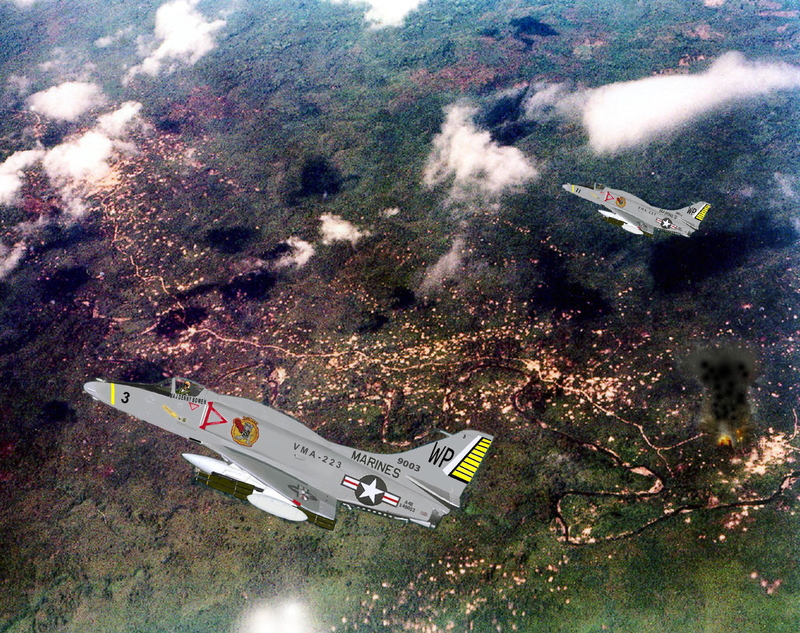 Hal was assigned secondary responsibilities on the A4D, F8U and A3D. Additionally, Test Pilots were expected to fly all aircraft undergoing flight test by the Flight Test Center. The YA4D was being flown by Major Jim Felliton, USMC, project officer in the Carrier Suitability Branch of Flight Test. The aircraft was assigned to carrier suitability because landing gear operation problems required the landing gear to be down all the time. Hal took his first flight in the YA4D in November 1955. Hal flew the Skyhawk around dirty [landing gear down] practicing slow flight and stalls. He made seven practice touch and go landings and a final landing on his first Skyhawk flight. The first YA4D to arrive at Hal's job site at Flight Qualities and Performance Branch was BuNo 137818 in early 1956. The Skyhawk was put into an accelerated sixty day test program for the purpose of evaluation and discrepancy discovery for correction prior to extensive testing and evaluation of aircraft flight qualities and performance. Gordo and Hal flew the plane a lot, exploring stick force per g, minimum distance take-offs and landings, flying qualities, fuel specifics and maximum performance runs. A photo panel with selected flight and test instruments was installed in the "hell hole" of the test airplanes. The pilot would only have to record frame numbers when he recorded data, and the engineer would read and reduce the data upon landing. Later that summer the Fleet Introduction program (FIP) was conducted at Service Test, and Major Tom Miller (LtGen USMC Retired) was the first Marine to fly a "production" model of the A4D-1. These first four aircraft were really challenging. They weighed some 9800# empty and everything seemed to go wrong on test flights. During these early flights test pilots discovered that the speed brakes cracked in a high speed dive, the metal flange alongside the vertical tail peeled back in high speed runs and the slats tended to hang up resulting in violent accelerated stalls. In addition, the oil pressure gage was a simple flip/flop gage, with barber poles the only indication of pump/oil failure. When parts or instrument failures were encountered, the failed part was removed from the Skyhawk, put on an airline flight to DAC, El Segundo, CA, repaired and returned quickly to be re-installed for further tests at Pax River by one of the many DAC techs. The plane had been built very close to the "structural margin," so parts failed frequently. Navy test pilots worked closely with the Douglas test pilots, and sometimes on NPEs they would give Gordo and Hal "back door" information on discrepancies that the Company was not addressing. For example, on one NPE, a DAC test pilot briefed Gordo and Hal on the conditions which would result in Pilot Induced Oscillation (PIO) in the A4D-1. The Douglas company would not acknowledge the problem, and it wasn’t until Pax River test pilots duplicated the condition that it was fixed. This backdoor info, which Hal and others kept confidential, helped immensely on a NPE as Navy flight test pilots normally got only a maximum of three flights each to discover discrepancies. Meanwhile, Flight Test continued with the test procedures to include minimum distance takeoff and landing performance, climb performance, speed at altitudes and carrier suitability. Another plane, BuNo 137826, arrived for further data accumulation, and in September 1956, 137819 arrived for fuel testing and specifics. Hal and other test pilots continued to find fault with many features of that early A4, most of them structural failures and low 'g' availability. In September 1956 Hal and another Pax River test pilot were dispatched to Edwards AFB to evaluate two X models. One had a "potato chip washed out wing" (WOW) that stopped some span-wise air flow and gave 0.5 more "g". Test evaluation was done on another aircraft with a Cambered Leading Edge, similar to that installed on the FJ-4. Unfortunately, neither modification was a worthwhile improvement. While there Hal also tested the first YA4D-2, 142082. It was a great improvement over the first YA4D-l, both structurally and from a flying-qualities standpoint. During the testing, enough unfavorable comments were written about the A4D-l to cause CNO and BUAER to send Lt Hank Hancock and Hal Vincent to North American Aviation at Columbus, Ohio, to evaluate the FJ-4 with a Mk 28 Special Weapon on the right wing as a possible replacement for the poor-performing A4D-1. As it turned out, the FJ-4 had to attain 156 KIAS with the stick/aileron full to the left side to have enough control effectiveness to raise the wing on takeoff – then in a steep dive with speed brakes out, the plane went supersonic due to lack of speed brake effectiveness. The plane, designed as a fighter, had only about 3 # per g versus some 7-8 # per g required in an attack plane. At approximately 560 KIAS, the FJ-4 had little or no aileron control. One could see the vapor on the wings as the ailerons attempted to turn the plane, but it rolled about 3 deg/sec opposite to the control input. There was just not enough pressure available in the aileron when deflected to produce a rate of roll under those conditions. North American responded quickly and put an additional set of speed brakes on the FJ-4. They fixed the control system and put spoilers on the FJ-4 which gave a reasonable rate of roll of 40 deg/sec at high speed with the asymmetric load on the right wing. After following the Navy interest in switching to the FJ-4, Ed Heinemann immediately set out to correct all of the Navy Flight Test reported deficiencies of the A4D-1. The resultant rapid improvements in aircraft reliability and performance caused the A4D to be chosen over all competitors by the Navy for fleet acceptance and subsequent mass production. Hal Vincent recalls, "At various commands, I flew all models of the A4 from the YA4D-1/A4A through the A4M, including Skyhawk #2960, the last production A4 which now resides in Major General Bob Butcher’s Flying Leatherneck Museum at MCAS Miramar. All in all, a great 26 years with the A4. What a plane!" Hal Vincent's tour in Flight Test concluded when transferred to MCAS El Toro to the first USMC West Coast F8 Crusader squadron in 1958. 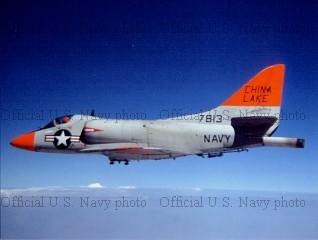 However in 1960 his involvement with the A4 continued with his assignment as Conventional Weapons Development Officer and Test Pilot at Air Development Squadron 5 (VX-5) at China Lake.